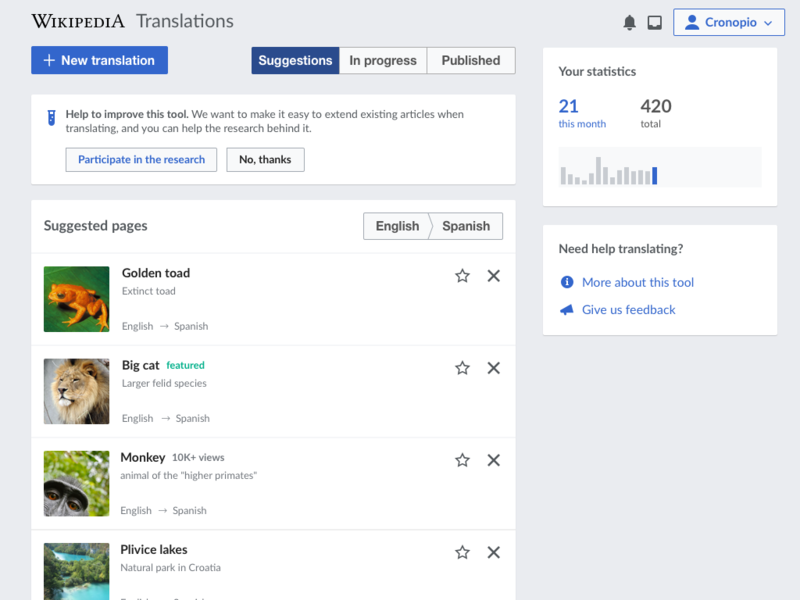 The Research team (Research) is working on an area that is relevant to Content Translation, and needs contributions that are related to translation. Since this may be relevant to Content Translation users we want to invite them to participate in this research. The invite will be shown on the suggestions tab of the translation dashboard. The invite will be shown when both the source and target languages selected for suggestions belong to the list of languages the research is targeting (Arabic, Japanese, English, French, Spanish, Russian). Discarding the invite won't show it again for the user. The invite will be available for about 2 weeks. The invite will be developed in a way that can be repurposed in the future. The idea is to use a similar invite to encourage users to try the version 2 of Content Translation when it is ready for a wider exposure. Help to improve this tool. 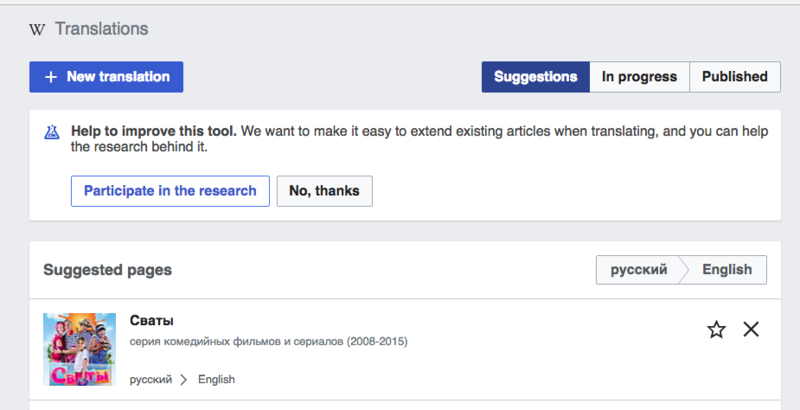 We want to make it easy to extend existing articles when translating, and you can help the research behind it. leila added a project: Research. leila added a subscriber: bmansurov. @Pginer-WMF, is that message displayed when people choose pairs of languages or by default? If by default, there is a risk that people feel surprised when they will see language that are not theirs. Also, most people having wok in progress on CX have a direct access to the "In progress" page than the "Suggestions" one, right? Will they see that message? The message will be shown only when the selected language pair is one of the language pairs that are relevant for the research study, and the target link will include the language parameters for people to provide translations on the same languages by default. That is, a user that selected Russian-to-Japanese will see the invite and reach the research page for those languages. The initial idea is to show the invite on the suggestions view only. There is a significant percentage of people that create translations by suing suggestions, those people may also more open to try new things (as opposed to go to the tool to translate specific article they already have in mind). We can consider making the invite more visible by showing it in other views, but note that for the In-progress view the default language filters are "All languages" to "All languages", which makes it hard to target the right users. When will it be out? I'm asking for User-notice. It will go along with a train this week. IIRC, there is no train this week, while the Release Engineering team has an offsite. Anyway, that should be in the next edition of Tech News. Checked in cx-testing for different browsers. All specs are in place (the icon looks a little bit too small, but the icon size was small in the mockup too, so it's subjective). The invite will appear again if the same user logs in from a different computer or a browser. Yes, that is to be expected. We have agreed to use local storage here and local storage is browser local. We don't use database in this case to simplify the process of getting invitation in production, because it will be displayed for 2-4 weeks. Because of this, DB usage might be needed in the future to save the user's choice, but we don't need it yet. CommunityTechBot assigned this task to Petar.petkovic. CommunityTechBot renamed this task from g5caaaaaaa to Invite to participate in research from the translation dashboard.